There's nothing worse than having insects invade your home and bed bugs top the list as a major nuisance. They might be tiny, but they have a major impact on your well-being. It's hard to have a good night's rest when you are getting covered in tiny bites. Even more aggravating is the thought of little critters sleeping with you. Fortunately, you have options. 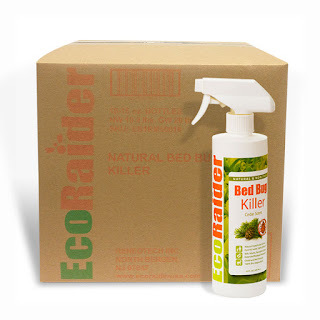 EcoRaider is here for you to kill bed bugs, eradicating the problem at the source. Best of all, the company is committed to going green, using natural products that will not have leave toxins in the environment. Get rid of the bugs without hurting anything or anyone else. EcoRaider makes your health and safety a top priority when you have a bed bug invasion. A pest control product is used that is considered safe for everyone in your household. It contains organic ingredients that are natural and effective in eliminating bed bugs. Your pets and your children will be protected from exposure to toxins when the house is being treated. While you want to get rid of the annoying nuisance of bed bugs as soon as possible, you don't want to create a harmful environment. EcoRaider is here to get the job done and put you first. With EcoRaider by your side, your bed bug problem will be a thing of the past. It's all about finding the right kind of product. EcoRaider uses an award-winning plant based ingredient that gets the job done. The team will get to the root of the problem, eliminating bugs and eggs all at once, breaking the cycle. Once your bed bug problem has been treated, you can expect the results to last. As a rule of thumb, the majority of your bed bug infestation will be eliminated in only one hour. Residuals of the product are left behind to ensure that your bed bugs will not come back. When beg bugs are hassling you, don't procrastinate. There's no reason for you to be miserable for another day. Contact the crew at EcoRaider and get rid of your bed bug troubles as soon as possible. You'll go green and you'll get to say goodbye to a pesky problem, allowing you to sleep well again.